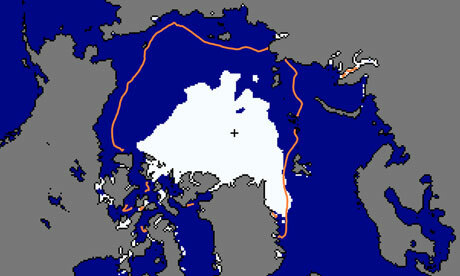 The unprecedented loss of sea ice in the Arctic this northern summer has made the news lately. 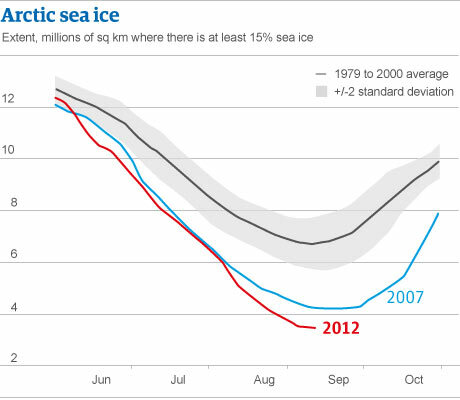 The images below from the Guardian article Arctic sea ice shrinks to smallest extent ever recorded show the problem. But this second figure brings it home to me. What we are seeing is the possibility of future commercial sea navigation through the Arctic circle – initially seasonal but eventually throughout the year. And increased exploitation of natural resources. Already major powers are lining up to take advantage of improved access and international political conflicts are emerging. It looks like the first major political and economic effects directly attributable to human caused climate change will probably emerge around the Arctic. And in the not too distant future.